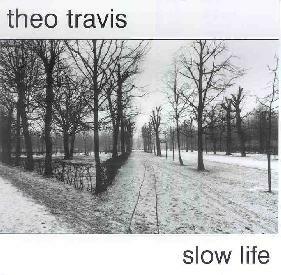 Theo Travis - "Slow Life"
Theo Travis is an active jazz saxophonist who also has an interest in ambient and spacey experimental music. Aural Innovations readers will know him from his participation in recent years with Porcupine Tree and Gong. The last project I heard from Theo was the latest Cipher CD (see AI #21) which consists of beautifully sculpted soundscapes produced by sax, flute, keyboards, bass, and a little help from Daevid Allen's gliss guitar. Slow Life is a set of solo alto flute pieces recorded using what Theo calls his "system of ambitronics", which is described as a series of foot pedals enabling him to build up layered loops of flute and spontaneously overdubbing other flute lines. There are no efx that morph or distort the natural sound of the instrument, but the resulting layered loops do produce an ethereal atmosphere within which the flute can explore, and makes for a surprisingly full sound given the solo nature of the album. The music is generally slow paced, with deep consideration given to each note and phrase. One of my favorite tracks is "Sleep", which features a somber but beautiful melody that reminds me of a Chinese film I can't quite place. Some of the music brings to mind Robert Fripp's soundscape guitar works, though Theo's flute is more pleasant and atmospheric as opposed to the robotic Fripp sound. Overall, Theo's flute excursions did a good job of holding my attention throughout the set. If you're in the mood for an ambient melodic solo flute journey, there's some hypnotic music to be heard here. For more information you can visit the Theo Travis web site at: http://www.theotravis.com. Slow Life is distributed by Ether Sounds Records. You can visit their web site at: http://www.ethersounds.com.